Welcome to your review of the Plus500 platform. If you’re new to Plus500, it’s a CFD broker initially designed and implemented in Israel. The platform is listed on the London Stock Exchange, and subsidiaries of Plus500 are also authorized by a number of major regulators. 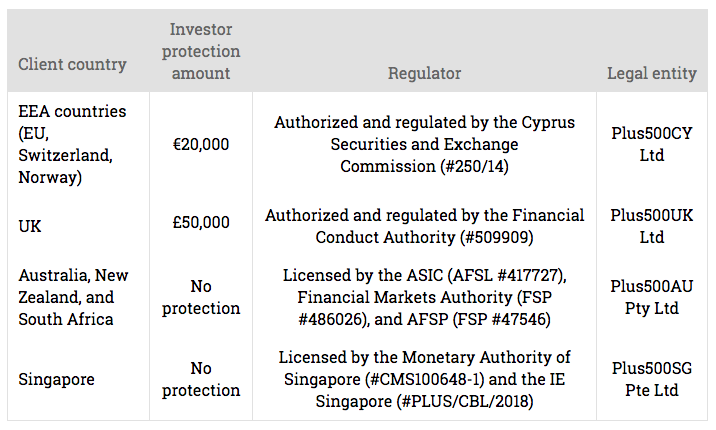 Some of the major top-tier regulators watch over the application at present, including the FCA of the UK. Generally considered safe and reliable by most of the people who use it, Plus500 is listedon a stock exchange, always reveals information about its financials, and is also regulated by the top industry regulators. What’s more, Plus500 also offers some trading opportunities as a Forex broker, as well as being a CFD solution. Crucially, it’s important to remember that when you’re thinking of using a CFD broker, you do put your money at risk. Any trading strategy comes with its risks. However, a vastmajority of retail investor accounts do lose money when trading CFDs with the Plus500 platform. With that in mind, you should never put your money into a CFD trading system if you can’t afford to lose it. Notably, day trading is not an option for people using Plus500. If you plan on opening and closing the majority of your positions quickly, then your account is likely to be blocked by the Plus500 administrators. Thismeans that you should probably avoid this brokerage if you want to make money fast on day trade positions. If you’re looking for more long-term trading options, then Plus500 is a relatively easy-to-use platform with low spreads to consider. There’s also excellent user experience support, and it’s listed on the London Stock Exchange, which should give you some peace of mind. Plus500 also has the option of offering some cryptocurrency based CFDs too – so that could be appealing for some traders. Unfortunately, in terms of negatives, you will only get a limited product portfolio from Plus500, and the financing rates are relatively high. What’s more, there are minimal tools available for research. You’ll struggle to find information in the form of recommendations, news feeds, or fundamental data available. One of the most common aspects to look at when you’re deciding on a brokerage platform to use is how much you can expect to pay in fees. The first thing you should know is that the trading fees for Plus500 are low. There’s no commission to worry about, and everything you need is includedin the spread. Both CFD and Forex trading fees are minimal with Plus500. In terms of financing fees per year, however, you can expect to pay a little bit more than you would with most providers. As you may already know, brokers usually charge financing rates for customers that hold leveraged positions for longer than 24 hours. The financing fees available for Plus500 are only available on the trading platform. Unfortunately, the calculation method used to provide those fees isn’t as clear as it should be. It’s also worth noting that Plus500 has the right to change its fees whenever it chooses. In terms of non-trading fees – the costs are relatively average. For instance, the withdrawal fee isn’t too bad, and you can make up to five withdrawals for free per month. After that, you’ll pay around $10 per withdrawal. Additionally, bank transfers are only $6. If you’re not active on your account, the fees are relatively high. With three months of inactivity, you’ll be chargeda $10 fee per quarter. Often, the best trading platforms are the ones that are easy to access and use. The good news is that Plus500 is very easy to open an account with. The experience can all be managed online, and you’ll have access to your trading account within the day. Additionally, the plus500 service accepts new customers from locations across the globe and it also allows UAE accounts. There are only a handful of exceptions. For instance, you won’t be able to open an plus500 account as a resident of Syria, Cuba, Iran, Canada, or the US. The minimum deposit level for Plus500 is 100 euros for your credit or debit card, and 500 euros for a bank transfer. There’s only one live account option to choose from, and no corporate accounts are available. All you need to do is sign up and start trading, and you’ll be ready to go in no time. The deposit and withdrawal experiences offered by Plus500 are incredibly good. You’ll have a range of options available when it comes to deciding how you want to submit or take your money. Additionally, there are multiple options available when it comes to opening your account in different base currencies. It’s not totally apparent at first glance how many currencies are available on the plus500 platform. However, customer support suggests that even some of the most minor currencies are supported. If you decide to change your base currency at any time, you’ll need to contact the plus500 customer service. Remember, currency conversion fees will not be chargedif you’re moving your account funds to your bank in the same currency. 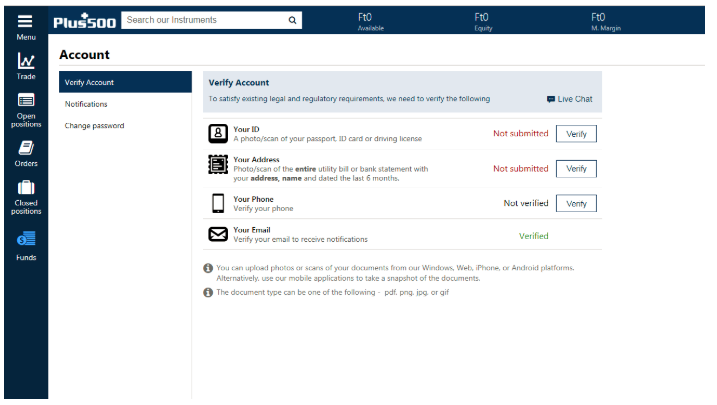 Notably, there’s no fee to deposit money into Plus500, and you can upload your money however you like, including through third-party tools like PayPal and Skrill, bank transfer, or credit or debit card. Bank transfers do take a little longer than electronic transfers. For up to five withdrawals per month, you can also access your money for free – with no charges at all. If you decide to make more withdrawals on the plus500 trading platform than that, then you’ll need to pay $10 each. Thisis a relatively competitive price. There’s also a minimum withdrawal amount to consider too. For a PayPal withdrawal, you need to take out at least $50, and for a bank transfer, you’ll need to withdraw at least $100. You can use all the same channels as you would for a deposit for a withdrawal. Plus500 also notes that it might take a few days for your withdrawal to come through. Keep that in mind if you’re in a hurry to get your funds. As a web trading solution, the Plus500 platform is easy to use, and it looks amazing. Unfortunately, you can’t customize it to suit your individual needs. The Plus500 has a uniquely developed web-trading platform that’s available in thirty different languages. What’s more, the service is clean and easy to use. Even if you’ve never traded with CFDs before, then you shouldn’t have a hard time managing the plus500 app. Though you can’t customize the service, it helps to know that there are some positive features to consider, including the option for two-factor authentication to keep your account secure. There’s also Facebook and Google authentication available too for the plus500 trading app. In terms of searching for new trading options, you should find it very easy to track down whatever you need. You’ll be able to seethe products categorized on the left-handside of your platform, or you can type the product name in manually instead. For placing orders, you can expect a mid-range experience, including a guaranteed stop-loss, market order, limit order, stop loss order, and trailing stop. One particularly excitingcapability is the notification and alert function. You can set up your emails, push notifications and SMS to suit your needs, and this is great for finding out when the price of an asset is set to reach a specific percentage. You’ll also be able to set up alerts if the sentiment around a specific asset changes. Another great feature is the transparent fee and portfolio reports that come from Plus500. It’s easy to see how many overnightfees you’ve paid on your positions. What’s more,the current status of your portfolio should also be easyto follow when you’re examining the upper bar portion of the platform. Plus500, like many modern trading solutions, offers a mobile trading option as well as a web-based option. The mobile trading platform is stunningly well designedand easy to use. You should find that most of the features are the same as what you might expect on the web version of the plus500 platform. You’ll also be able to use your smart watch to download the app if you want to. Unfortunately, while the Plus500 experience has a lot to offer as a trading platform, it’s only designed for use with Forex and CFDs. There are indeed a lot of CFDs to choose from, but you’re still relatively limited in your options on the plus500 platform. If you’re looking for a fundamental Forex and CFD broker, then you can’t go wrong with Plus500. However, you need to bear in mind that you won’t be able to trade things like stocks and cryptocurrencies. However, there are some cryptocurrency-based CFDs out there. In terms of versatility within your CFDs, there’s more range available from Plus500 than from the majority of companies. There are also some cryptos, but less than many other trading platforms. Additionally, you can’t control the default leverage level of the products, which is a no-go for some people. Perhaps the two most disappointing features of Plus500 is the lack of research and education options the solution offers. Plus500 comes with very limitedresearch tools. Although there’s a good economic calendar available, a great deal of the fundamental data that you might need to make essential trading decisions is missing on the plus500 platform. There’s no newsfeed to join the well-designed calendar on the newsfeed, and you won’t be able to access any additional updates either. There’s also no recommendations available. Although it’s nice that you can filter the economic calendar for company earnings and macro events – there simplyisn’t enough for most people in the system. However, there is a relatively useful market sentiment tool, which shows the percentage of sellers and buyers at Plus500 and may help you to make some trading decisions. In terms of educational options for people who want to learn about trading, the possibilitiesfor Plus500 are limited again. The company only provides a demo account where you can practice your trading strategies before you open a full account, that’s about it. On the plus side, while research and education are poor, things start to pick up again for Plus500 when it comes to security and customer service. The customer support is excellent, with both email and live chat that you can rely on to get answers to you as quickly as possible. You can rest assured that someone will always get back to you as soon as you can when you fill out a request for support on Plus500. What’s more, even the email support can be relied upon to give you a quick answer. Most of the time, you’ll be able to get a response within an hour – which is a lot faster than the support you could get from other brokers. Plus500 is one of the few providers to offer a complete 24/7 live chat service. It’s also one of the safest brokerages on the market today. Listed on the primarymarket for the London Stock Exchange and regulated by groups like the FCA, it’s a broker that can be trusted. The company has been establishedfor over a decade, and it makes sure that customers are protectedif something goes wrong. Plus500 operates a wide range of subsidiaries. Depending on where you’re located, you’ll be servedby one of these smaller companies. The protection that you get will depend on where you live. For instance, people in the UK can sign up with the Plus500 UK subsidiary, andthey’ll have protection for up to £50,000 in investment. This protection is supported by the FCA. Sometimes, it helps to know a little bit more about a company before you start trading with them. The Plus500 brokerage is listedon the centralpart of the London Stock Exchange. For many users, this is a huge plus when it comes to security and peace of mind. What’s more, it’s worth noting that the company also has a very strongand powerful parent company. When a broker has a good parent company, this is a sign that it can be given additional capital when necessary, which means that you get extra protection as a user. The biggest owners responsible for Plus500 today include huge asset management companies like Morgan Stanley and JP Morgan. In other words, you shouldn’t have to worry about investing with this trading broker. Also, Plus500 has been in the industry for more than ten years, so you know it has a good track record. Usually, when choosing a brokerage, it’s best to go for someone with a long track record. Extended track records typically mean that the company has been able to get through difficult economic and financial moments. Like any provider in the market maker model, Plus500 is the counterparty when you’re trading on their platform. If there’s a default issue with Plus500, then it may not be able to pay you. Thismeans that you’d have to rely on your investor protection. However, being listed with the FCA makes Plus500 very reliable. Only you can decide which broker is right for you. However, it’s fair to say that Plus500 is a reliable company that’s designedfor people who want to get involved with CFD trading. Ultimately, the platform is largelyregarded as safe because it’s listedwith the London stock exchange. It’s also regulatedby the FCA, which is a good sign. Additionally, the platform is very easyto use. Whether you’re using the web-based platformor the mobile solution, you should expect a good user experience. Anyone can navigate the app with simplicity, and the spreads are highly competitive. Unfortunately, there are some downsides too. For instance, the education and research tools are inferior. What’s more, the fees for financing are higher than usual also. On top of that, Plus500 is not designedfor day trading; youraccount can be blocked and closed if you try to jump through positions quickly using Plus500 as your brokerage channel.